Shelley Bean: Paper Patch Crafts Challenge-Gratitude!! This week I was selected to host the challenge blog at Paper Patch Crafts. I decided I would center the challenge around Gratitude. November is the traditional month to remember what we are thankful for, and the 1st thing that comes to my mind is always my wonderful family. Lately, it's been Grandchildren! I don't have very many photos yet of my new grandson, but hope that I will very soon. 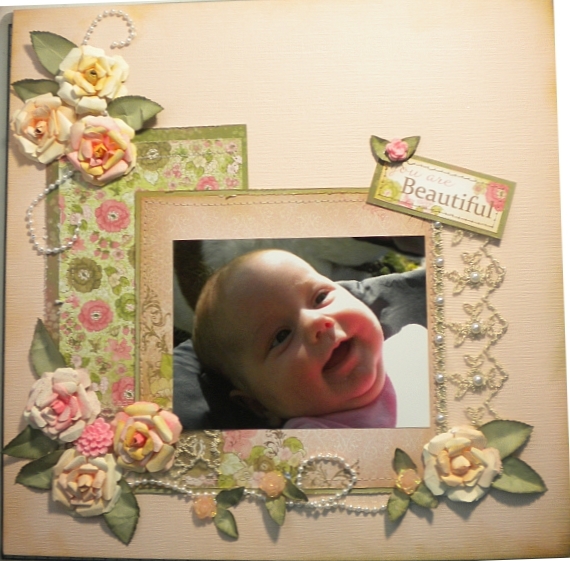 In the meantime, I decided to create another layout centered around my adorable granddaughter. This was a photo that was taken while her grandpa was holding her at the park, and I loved the way the light touched her face. Anyway, I also wanted to share with you how I made it. The paper was acquired from the fantabulous store Paper Patch Crafts. This particular line is Kaisercraft Chanteuse Collection. I also used a touch of the beautiful Webster's Pages Lace also available to purchase at the store. The roses are ones I created myself, and will share with you a video tutorial I created to show how I constructed them. I would appreciate your feedback! Please come and join us at the challenge going on now through Saturday, midnight. Anne, the owner of the store has generously provided a prize for the challenge entry randomly chosen. I would be so flattered and honored if you would come and participate in the challenge. All you need to do is create any project that is centered around gratitude, or what you are thankful for.